Caulked N' Ready is one of the latest "why didn't I think of that" products from FastCap. As the title suggests, it is a holster for your caulking gun. I use a caulking guns quite a bit in my line of work and one of the problems I run into is where to put the dripping caulking gun when I need both hands. Sure some caulking guns have hooks on the back, but if you ever try to hang it off your pants, or ladder, you end up with goop all over everything. 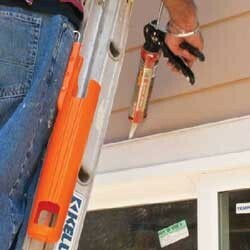 The Caulked N' Ready has an adjustable hook to fit people of all arm lengths, and it also has a needle and reservoir to keep the dripping caulking at bay. It is also great to see that the Caulked N' Ready is made in the USA. At only 12 bucks, you can be the fastest caulking gunslinger in the West.